The best known gamer in Australia and star presenter from the ABC’s Good Game television program, Hex, will be the highlight guest at a Gamer Dev Jam to be held in Merimbula next month. Organised by IntoIT South Coast in collaboration with The Loaded Gamer team in Canberra, and Brennan Hatton and Buzzy TV in Wollongong, the Gamer Dev Jam will be held on Saturday and Sunday, September 10 and 11, at the Bega Valley Regional Learning Centre, 14 Cabarita Place, Merimbula. This will be a multi-skill game-development gathering and what is needed for its success is to attract a range of talented creative people - story-writers, coders, musicians, graphic artists, entrepreneurs and gamers to act as testers. The expected outcome of the weekend is a number of functioning games, albeit in their early development stages. Supporters and attendees include The Loaded Gamer team who run an online magazine connected to the gaming industry; indie development houses Buzzy TV and Siege Sloth; and a number of talented game developers led by Brennan Hatton who spent a several years developing for Meta in San Francisco. South East Arts (southeastarts.org.au) has art on screen as a key theme for their 2016-17 strategy and gaming is a major element. Analogue synthesiser specialist Abre Ojos will be providing instruction in electronic music creation. For a brain- sizzling weekend go along and play with the Nao Robot on a visit from the University of Canberra and, in a special treat for musos, 5 Abletron ‘Push’ electronic music consoles will be available to attendees for music creation. Scott Baker from the Bega Valley Shire Library Service will provide fast-track tutorials on making music tracks for games and there will be a virtual reality demonstration system, the popular HTC Vive that was seen recently at CoWS Near The Coast. The final format for the program will be announced closer to the event but you can buy tickets now on Eventbrite. 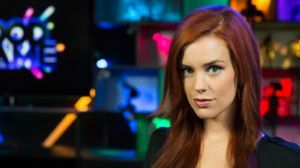 Photograph: ABC TV’s Good Game presenter ‘Hex’ will be the highlight guest at the Gamer Dev Jam in September.